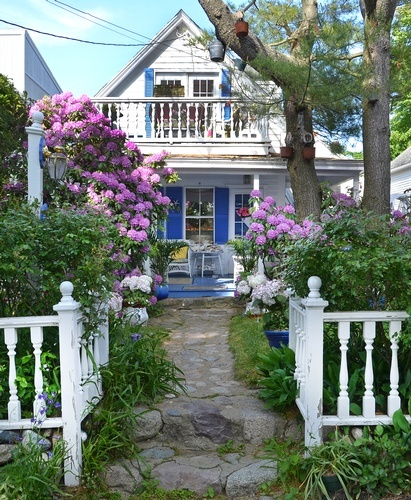 A Lady Winette Cottage is a romantic bed and breakfast in Massachusetts located on historic Marblehead Harbor, A Lady Winette Cottage is centrally located to Boston, MA, and Salem, MA. If you are looking for accommodations close to Salem, we are a 10 minute drive away. Come to A Lady Winette Cottage for a welcoming, relaxing atmosphere, which is centrally located to a number of shops, restaurants, and historic sites. Victorian cottage built in the 1890's as a seacoast cottage retreat, it's a peaceful and romantic escape, smoke and pet free. Families with children over 5 years and older are welcome. Harbor front and ocean views provide the backdrop for your relaxation and enjoyment nestled amongst gardens facing historic Marblehead Harbor on prestigious Marblehead Neck. Fall asleep listening to the gentle lapping of the waves or enjoy your private deck watching the sailboats in the harbor. The Harbor Room costs $150.00 a night. The Garden Room costs $125.00 a night.